You can also determine if there is contention for shared server processes by querying the wait and totalq columns of the V$QUEUE dynamic performance view. "Average Wait Time Per Requests"
You can also query the V$DISPATCHER_RATE view to analyze connection. The V$DISPATCHER view contains columns grouped under CUR,AVG and MAX. Compare CUR and MAX values. 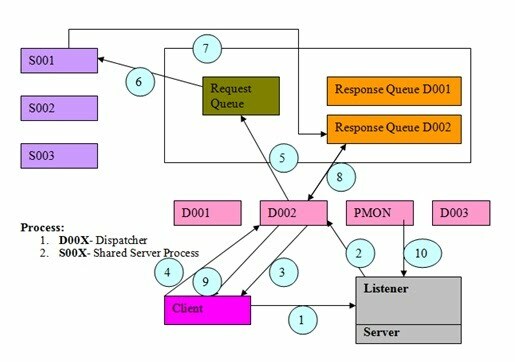 If the performance of connections using shared servers are not satisfactory, and the CUR values are close or equal to the MAX values, then you should consider increasing the number of dispatcher for the corresponding protocols. If, on the other hand, you find that the performance is satisfactory and the CUR values are substantially below the MAX values, you have configured too many dispatchers. Consider reducing the number of dispatcher. SQL> select SUM(value) ||'bytes' "Total session memory"
SQL> select SUM(value) ||'bytes' "Total max memory"
For all Oracle Shared Server Connection, you need to compute the amount of space required for all shared server users to put their session memory in the shared pool. If needed increase shared_pool_size. You can shutdown any specific dispatcher. The Dispatcher stops accepting new connections and will wait until all of the sessions it handles are disconnected before shutting down. The IMMEDIATE keyword stops the Dispatcher from accepting new connections and immediately terminates all existing connections through that Dispatcher. After all sessions are cleaned up, the Dispatcher process shuts down. When a Dispatcher is shut down, other Dispatchers will not inherit the name, so it is possible to see some Dispatchers missing. When starting up a new Dispatcher, it will obtain the next open Dispatcher name. In the case where TCPS D002 Dispatcher was shut down, and a new Dispatcher for TCP was started, the new Dispatcher will be called D002.